Abrawny man wearing a kilt crouches to hoist a 16-foot pole above his shoulder. In a few swift steps, he launches the nearly 100-pound piece of timber through the air, sending it end-over-end to land about 30 feet in front of him. This is the caber toss, one of a handful of Scottish traditions that will be showcased this month during the Grandfather Mountain Highland Games, which also features piping and dancing, genealogy exhibits, and other displays of strength such as tugs of war. Ongoing since 1956, it’s one of the largest displays of Scots-Irish heritage in America, attracting nearly 100 clans and more than 30,000 people. 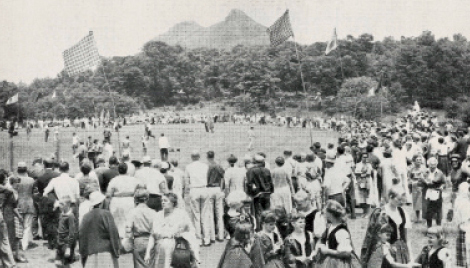 The newer Foothills Highland Games, held in November near Hendersonville, offers much of the same, but this is a tradition that far predates the exhibitions held in WNC. The games began centuries ago in Scotland and were originally war games where prowess, strength, and swiftness were tested through rigorous competition. The caber toss was a demonstration of brute force, as were the stone put and hammer throw. Foot races allowed the chieftains to see who among their followers was the fastest at carrying messages in times of war. The games were normally held following a tainchel, a great hunt where clans joined to drive deer and other game to awaiting archers. The hunt was followed by grand feasting and days spent in various games of sport. Piping and dancing were as important as the field games, for they allowed clan members to demonstrate their agility as they performed the complicated steps of the Highland flings. The games became formalized in Scotland in the late 1700s and, by the mid 1800s, heritage societies in the United States were hosting similar spectacles of their own. Considering WNC maintains a large concentration of Scots-Irish descendants, it’s no wonder these events still thrive today. Each celebrates the region’s Celtic ties and invites visitors with the traditional Gaelic greeting, “céad míle fáilte!”—a hundred thousand welcomes!